Comes with durable Steel Swivel. The product is made to the highest specification and is quality tested and guaranteed. THIS SET CONSISTS OF: 1. SPEED BALL PLATFORM 600mm x 18mm MDF board white finish both sides ultra stable this is the wooden platform that the ball attaches to using the ball bearing swivel. It is held in place onto the wall using the metal bracket and has been coated with high quality waterproof Enamel paint for lasting durability. 2. METAL WALL BRACKET simply remove bolt and three re-position for height adjustment removal or folding. Which allow you to affix platform at any desired height on the wall. The bracket is made from Metal which has been made to the highest standard and then powder coated to protect the metal from rust and scratches. 3. SPEEDBALL is made from Cow hide leather and is laminated inside with several layers of cloth to give it the weight, strength and life. The ball is hand stitched and has a beautiful design with white stripes contrasting each panel. It is inflated using a regular football pump. 4. SWIVEL is finished in beautiful chrome; it has a removable design which allows it to be removed as desired. 5. LEATHER GEL GLOVES Ideal for speed ball and bag works with super dense integrated gel and liner Velcro cuff allows easy on and off. Pro design for speed and combo punching. 6. PAIR OF HAND WRAPS is made from a poly cotton mix and can be used as inner for professional boxers or can be used while practising on the speedball set. 7. SPEED ROPE made from nylon with plastic handles. An excellent tool to enhance your cardiovascular workouts, for both adults and juniors. 8. HAND GRIPPERS allows you to build muscles for wrist and arms. 9. KEY CHAIN is an accessory range. These unique Leather Maui Thai Kickboxing Boxing Glove key rings are made leather. 10. CAR GLOVES can be hanged on the rear view mirror to give your car that personal feel and look. 11. WRIST BAND gives extra wrist support at max level. 12. BOLTS, wall plugs, nuts and bolts. 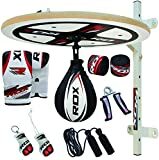 Excellent for tumbling, exercise programs, pilates, stretching, yoga, martial arts, gymnastics, day care activities and many other uses. Four folded design is ideal for multiple-use. Made with 5cm thick high density long-lasting EPE eco-friendly foam. PU Leather: The non-absorbent shell which is mildew resistant provides sanitary protection for your workout needs and is sealed by zipper. Lightweight. Folds up easily for carrying and storage. Sewn handle for easy transportation. Made from durable PU leather which is non-absorbent and will enable you to clean it easily. Thick handles for easy carrying. And the thick Foam makes it very comfortable and safe.